Use a pencil brush to apply Busted on the lower lash line, just about one-third of your lash line, from the outside corner. Apply Bootycall from the inner corner of the lower lid up to where you have applied Busted. Blend the two colors lightly. 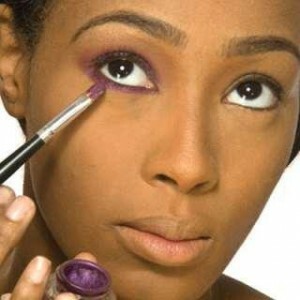 Be sure to keep as close to the lash line as you can so you do not end up looking like a raccoon. The colors are meant to emphasize the full shape of your eye.